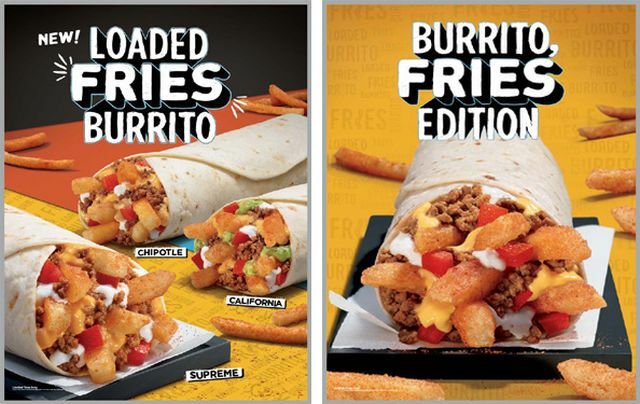 Taco Bell integrates the fries they've been trialing into the new Loaded Fries Burrito, an item testing over in the Charleston, WV area. The test item comes in three varieties: Supreme, California, and Chipotle. Supreme features seasoned ground beef, seasoned fries, diced tomatoes, nacho cheese, and sour cream wrapped up in a flour tortilla. The California version includes the same ingredients plus guacamole, while Chipotle Loaded Fries Burrito adds chipotle sauce instead. Adding fries to burritos is not exactly unprecedented among major fast food chains as rival Del Taco currently offers a number of burritos with fries inside. Also, it wouldn't be a stretch for Taco Bell since they already offer burritos (and a taco) with Fiesta potatoes inside. The burrito are being offered at $1.99 a piece during the test. They can also be had as part of a $5 Box along with a Nacho Cheese Doritos Locos Taco, a crunchy taco, and a medium fountain drink. During the test, Nacho Fries are also being served. It's a dish that was part of a test of the fries earlier this year (that was also located in West Virginia).